Weddings are the time to experiment with fashion. This is one occasion where you get to see numerous new and innovative styles. If you have a wedding to attend, then here we give a run down on the top picks of hairstyles that are suitable for an occasion like this. One of the new entries into the style industry is the balayage style. Combine it with a ponytail and you will get the ultimate look of beauty. All you need to do is scoop up your hair and tie it with a hair band. People also use different hair accessories to go with this style. Braiding your hair is one of the classics. It gives you a traditional look that creates a heavenly aura around you. This is a simple yet powerful look. Go for this look if you want to stick to your roots. This style is simple and hence you can add in a few accessories like a headband to enhance your look. Braid your hair if you want an authentic and ethnic look. To get some creativity and uniqueness to your braid, pin it up to form an updo. This is an excellent example of a classic hairstyle that coveys charm, grace and beauty. It will give you a powerful style that people will find difficult to forget. If you are looking to bring in some extra charm to a normal traditional updo, then go for curls. Curls are your best friend if you are looking to spice up your style. Additionally, if you are looking for a style that is new, then give bronde curly updo a try. You will definitely fall in love with this style. Brown is one of the most sought after colors among hair colors. You can sport many different hair style that specifically suit only brunettes. However, adding curls is one of the most common styles to go with. Curls look exceptional on brown hair and give the bearer a fun and beautiful look. Some people consider having long hair a boon. There are a plethora of options to style long hair, one of them being curls. Curls increase the appeal of your entire image. You do not need to style your hair any further; curls usually do an excellent job. 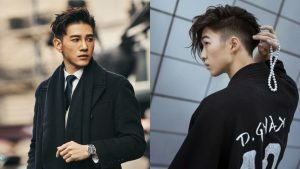 Go for this style, if you want a simple yet jaw dropping hair style. Headbands are the most common hair accessories used in the industry today. Chignon is a type of bun. If you are bored of this traditional bun, then add a few curls to enhance your look. Sporting a bun will give you a look of confidence and authority. 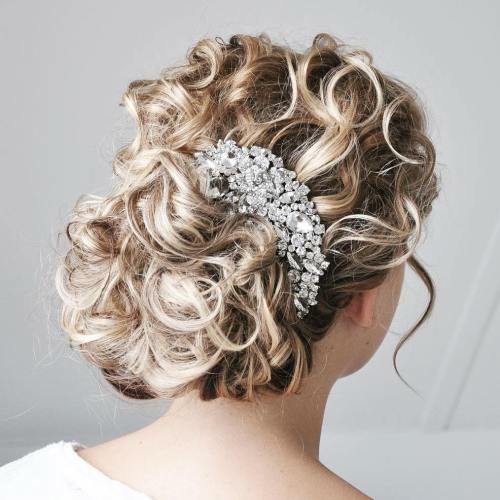 Curly hairstyles are one of the best hairstyles when it comes to styling for a wedding. Wedding is an occasion to sport different looks and experiment with different styles. People pair many styles with curls like a braid, ponytail, just to name a few. Go for a style that you are comfortable with and which enhances your features. Flowers are extremely common and are one of the most used accessories for your hair. Especially at wedding, you cannot see one woman without a flower in their hair. Flowers bring in some much needed ethnicity to your style that is both important and necessary at weddings. You also have a wide range of flowers to choose from. Choose a flower that complements your style. This is a hairstyle that gives you a polished and feminine look, along with being extremely fashionable. We find many celebrities sporting this look and it is one of the reasons for this style’s popularity. In this style a part of your hair is braided, while the other part is left free. It is suitable for work as well as any special occasion. Half up half down hairstyles are extremely popular. To spice up the style, this is combined with many different hair accessories like a head bow, head band, pins and many others. Adding accessories gives you a clean and sleek look. There are a plethora of accessories that go with this style. There are many things that you can do with half up half down hair style. One of them is the addition of curls. Usually, half up half down styles covey authority and power, and when mixed with curls, then give a look that has a balance of power and fun. Sport this look and make a strong fashion statement. Brunettes are people who have brown colored hair. They have plenty of options when it comes to styling their amazing hair, one of them being the addition of curls. Curls give your hair a bouncy look that is highly desired by women. You also add in a few hair accessories like a headband to make your style have a prominent and profound effect. Waves and curls is a match made in heaven. 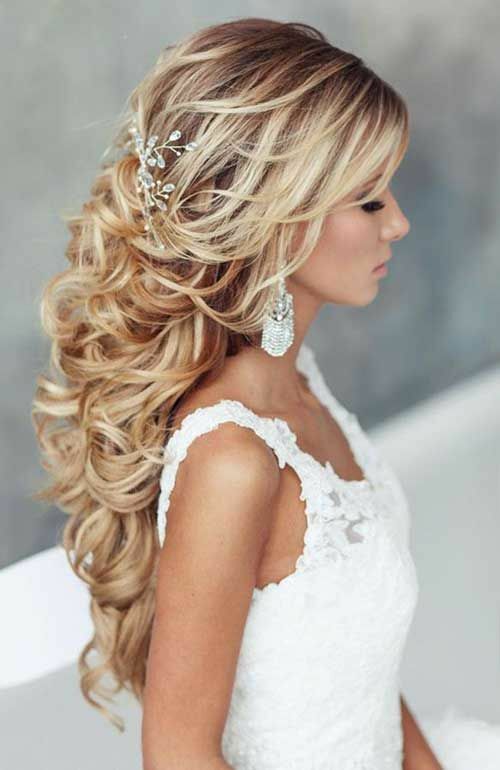 Long waves on your hair give the bearer a royal look and curls add a bit of enthusiasm and humor. Waves and curls can be sported with any hair, irrespective of the length. And that is why it is one combination that is extremely popular and will continue to be in demand for a very long time. Curls and long hair is one combination that every girl should try out. A curly style gives your hair a look of fullness and increases your elegance. If you do not want your curls to look prominent, then go for loose curls. Loose curls have a subtle effect on your style and give you a style that is simple and elegant. It is a common misconception that loose updo with curly hair do not go together well. However, they are far from the truth. Loose updo is an extremely fashionable hairstyle. And adding in curls spices up your entire image. Bangs always creates an impact and adds a few extra points to your style quotient. Combining this look with a low updo is a definite show stealer look. Sport this look if you are one of those who love the extra attention and likes being the center of attraction in a crowd. There are many different types of buns, one of the most popular among them being the ballerina bun. This bun got this name because this is the standard hairdo sported by ballerinas. Instead of going for a normal ballerina bun, add some extra effect like some messiness to this style. People also add a few hair accessories to go with this style. Buns are one style that have been in fashion for ages and will continue to be in fashion for many generations to come. However, sporting a normal bun is no fun. Spice it up by adding a few curls and getting a messy look. This will help you move away from the traditional bun that many people will sport and give you a unique and chic look. If you are looking for a style that coveys a playful and outgoing character, then go for a messy curly wedding updo. A curly updo is extremely common to sport and in order to stand out, add a bit of messiness to your hair. This will definitely increase your beauty quotient. Some people have straight hair. Similarly, some people have curly hair. People with curly hair are extremely fortunate and have a plethora of options to style their hair. The natural curl in their hair gives them an added advantage. Short hair is extremely common, one of the reasons being that it is extremely easy to handle and style. Usually, people having blonde hair and who have cut their hair short, go for curls. Curls add a few points to their beauty and exponentially increase their charm and appeal. Tired of short hair with curls? Looking for a new hair style? Go for the twist. All you need is a few pins. This is one of the simplest hair styles today, just twist different strands of your hair, pin it up and you are done. Go for this style if you are in a hurry and do not have time to do your hair. Irrespective of the length of your hair, short, medium or long, sweeping your hair to the side will definitely enhance your beauty. If you add curls to the mix, then you end up with a style that is the epitome of beauty and grace. Sport this look if you are one of those who love elegance and style. Flowers have always been the best accessory for your hair. If you want to make a simple hairstyle look extraordinary then adding in flowers always does the trick. And among all the flowers, rose has a unique appeal to it. Just sport an updo and add a rose on top to wrap it all up into a mesmerizing and unique style.